“The North” is a jazz quartet creating music combining the experiences of jazz musicians living in Canada and Scandinavia. Their recording “The North” won the 2018 Juno (Canada’s Aria) Award for Jazz Album of the Year. 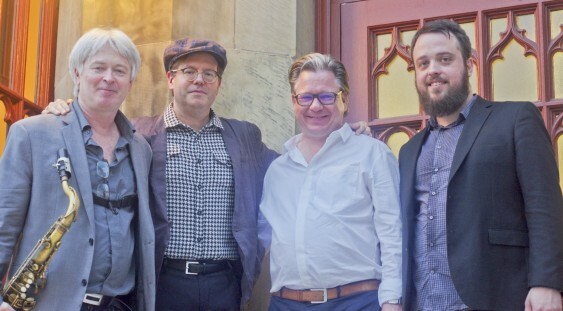 Multi-Juno Award winners David Braid and Mike Murley are long time musical collaborators as are Danish drummer Anders Mogensen and Finnish bassist Johnny Åman. After playing dates in Canada and Europe in 2015 and 2016 their debut album “The North” was recorded in Copenhagen and was celebrated with a 2017-18 cross-Canada tour supported by the Canada Council, JazzDanmark and the Danish Composers Association. In spring 2019, they will perform in Northern Europe, China and Australia. His arrangements and compositions were an integral part of the Chet Baker-inspired film, ’Born to Be Blue’ and his jazz score received praise for its “contemporary patina without sacrificing period authenticity” (The Times, UK). He also won ’Best Original Score’ and ’Best Original Song’ at the 2017 Screen Awards. An engaging, lyrical saxophonist, Murley is one of Canada’s finest jazz talents and one of the most versatile players on the scene today. He has appeared on fourteen Juno Award winning recordings, seven as a leader or co-leader and seven as a sideman. His most recent Junos include his trio’s ‘Test of Time’ (2013), Metalwood’s ‘Twenty’ (2017) and ‘The North’ (2018). Murley has toured and recorded with the cream of the Canadian jazz scene spanning a diverse cross section of artists that includes David Braid, Metalwood, and the late Rob McConnell, among others. He has also recorded and performed with many internationally renowned artists including John Schofield, Dave Liebman, Kenny Wheeler and John Abercrombie. In 2011 Murley accepted a full-time position at University of Toronto Faculty of Music where he currently serves as Area Chair of one this country’s most creative and vibrant Jazz Performance programs. He remains active as a leader in various formations from duo to septet. Johnny Åman was born on February 10th, 1986 in a small city called Nykarleby on the west coast of Finland. 2005 he moved to Sweden to study music at Malmö Academy of Music, and in 2010 he graduated with a Masters degree. Today Johnny is one of the busiest bass players in Sweden. Johnny has been recording and touring with among others Jerry Bergonzi, Dave Liebman, Marcus Strickland, Tony Malaby, George Garzone, Phil Grenadier, Peter Epstein, Gerard Precenser, Tomas Franck, Jonas Holgersson, Cennet Jönsson, Marcelo Coelho, Mathias Landaeus, Daniel Fredriksson, Jukkis Uotila, Carl Winther, Anders Mogensen, Petter Wettre, Anders Bergcrantz, Martin Küchen, Hans Ulrik, Fredrik Kronkvist, Lisbeth Diers, Chico Lindvall, Peter Nilsson, Emilio Martins and many more. For more than two decades, drummer Anders Mogensen has been one of the most sought after musicians on the Danish as well as the International Jazz scene. He has been a member of ground-breaking bands such as When Granny Sleeps, Jakob Anderskov Trio, Doky Brothers, Kasper Tranberg Yakuza Zhuffle, Lovedale and Copenhagen Art Ensemble. He has toured and recorded with Jazz Greats such as: Bob Berg, David Liebman, Steve Swallow, Marc Johnson, Brecker Brothers, Gary Thomas, Django Bates, Tim Hagans, Cuong Vu, Lew Soloff and Ray Anderson. Anders holds a position as Associated Professor and head of the Jazz Department at Carl Nielsen Academy of Music, Odense. And he has done clinics and workshops throughout Europe, USA, Japan and Brazil.